With 17 matches in the book, the fight for the Premier League crown is beginning to heat up. Manchester City held the lead in the league for just over 24 hours before Liverpool defeated Manchester United 3-1 to regain their lead. With just one point separating the two teams, we are in for an exciting second half of the season in England. The aforementioned Man U side have now conceded more goals this season, just 17 matches in, than they did the entirety of the 2017-2018 season. Sitting in sixth place and 11 points away from Champions League next season, Mourinho is on the hot seat more than he has ever been before. With all of that being said, I am back for my second Weekend Awards, now with honorable mentions and a brand new award! Undoubtedly the story of the weekend was the upset at St. Mary’s on Sunday morning. Arsenal came in to the away fixture with a 22-game undefeated streak, including a decisive 4-2 victory against their bitter rivals Tottenham to start the month. On the other end of the success-spectrum is Southampton. Fighting a relegation battle, with only 9 points in 16 matches played, Southampton looked to be another easy win for Arsenal. But just 20 minutes into the match, Danny Ings powered home a perfect cross to give Southampton a 1-0 lead. Just 8 minutes later Mkhitaryan equalized, but Danny Ings secured a brace before the end of the first half. Mkhitaryan got himself a brace in the 53rd, and the game remained even for 32 minutes. Nevertheless. Charlie Austin headed in a perfect ball for the game winner in the 85th minute (pictured above). 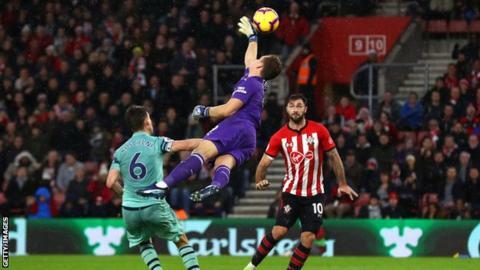 Arsenal manager Unai Emery admitted defeat in the end, telling reporters “Southampton deserved the result because they pushed and played with big ambition. This is football. Sometimes we could win that game but today we lost it.” Southampton’s victory sees them move up to 17th, still in relegation danger, but no longer in the relegation zone. Arsenal remain in 5th, just 3 points outside of the top 4. The high of Chelsea’s season came last week against Manchester City, handing them their first defeat of the season. With a poor result in a meaningless game against MOL Vidi in Europa League on Thursday, Chelsea looked to bounce back on Sunday against Brighton & Hove Albion with 3 points. And they did just that behind a marvelous performance from Eden Hazard. The Belgian has been making his case to become the new left winger in Madrid, and he was impressive today with a goal and an assist. A perfect pass set up Pedro for a tap in to give Chelsea an early lead, and Hazard added a goal himself to give Chelsea a 2-0, which was big enough to win them the game, 2-1. Los Blancos definitely had their eyes on this performance, as they could be looking to make a splash for Hazard as soon as January. Chelsea’s victory keeps them in 4th in the league, with a sizable goal differential lead over 3rd place Tottenham, Chelsea could realistically move into the title race by the end of the month. In a thriller and Match of the Weekend Honorable Mention, we saw Watford edge out Cardiff 3-2. The goal of the match, and in my opinion the entire weekend, came in the 52nd minute. Jose Holebas had a first-time strike on his left foot that gave the Hornets a 2-0 lead in the pouring rain. Oftentimes the unsung hero on the soccer pitch, goaltenders typically do not always get the love that they deserve. 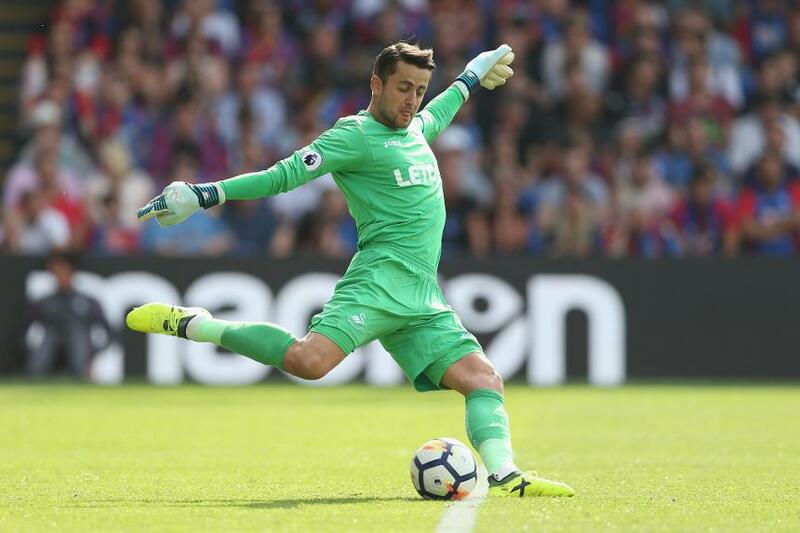 Even a goalie-apologist like myself did not give an award to the best number 1 of last weekend, but I am here to give the inaugural award to Łukasz Fabianski of West Ham. Fabianski’s 3 saves were the difference between 3 points for Fulham or 3 points for West Ham in the Irons’ 2-0 win this past Saturday. In a game controlled (for the most part) by Fulham, Fabianski was the rock that West Ham needed between the sticks in this match. This victory moved West Ham to ninth, just two points off of the top 6. Previous Previous post: Who Can Tame the NBA’s Western Conference?